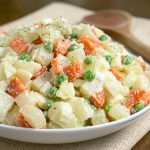 French Potato Salad is a welcoming blend of French herbs in a light red wine vinaigrette dressing. 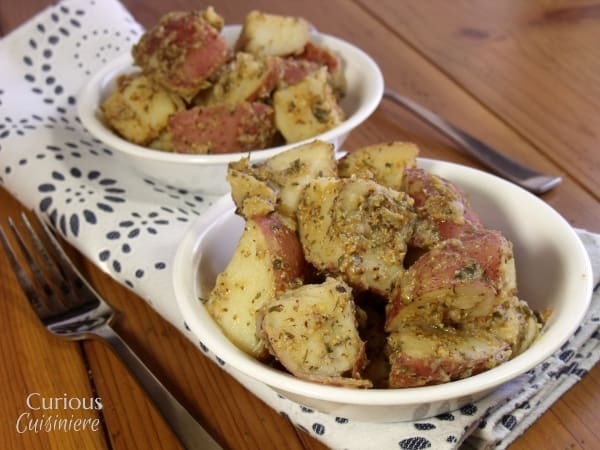 This potato salad can be served warm or room temperature. It is a lighter potato salad recipe that is the perfect dish for a summer cookout! 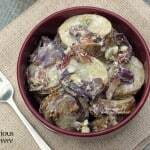 Looking for non-creamy/non-mayo based potato salads, we came across multiple recipes for a French Potato Salad, and they mostly fell into two camps. The Julia Child version with rice vinegar and parsley. 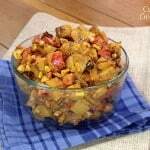 And, another version that was more of a mustard base with wine vinegar or white wine. Wanting to go for a more robust flavor, we decided to try out the mustard version. 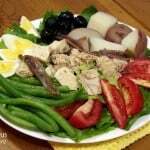 Every recipe for French ptoato salad seems to vary by the cook’s personal tastes, so after some searching we had a base line and hit the kitchen. But, I will say, our version is slightly different too. 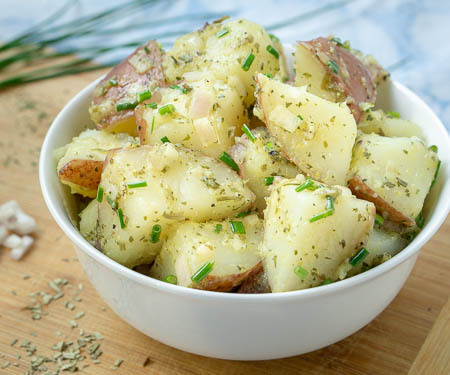 We used red wine vinegar instead of white wine vinegar because as we started making the potato salad, we realized that we were out of our our white wine vinegar. So, the red wine vinegar probably deepens the flavor a bit, and we’re excited to try this recipe again using white wine to see the difference. What Are French Fines Herbes? When you start diving into French cooking, you’re bound to come across something called “fines herbes”. Pronounced fin-zerb, it literally translates as it looks, to “fine herbs”. 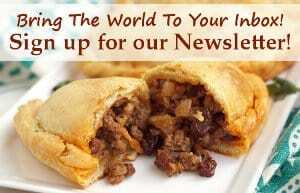 Now, you’re probably familiar with parsley and chives. Some people put tarragon in their chicken salad, but many are unfamiliar with it outside of that use. 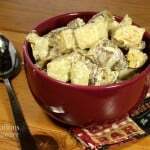 It is a gently flavored herb with hints of anise. If you don’t happen to have tarragonhanging around in your pantry, you can always leave it out. Otherwise, try some marjoram or or a pinch of dried fennel. Chervil is another one that might not be as common in your kitchen. (It took us a while to track some down.) Chervil has a taste that is like a cross between tarragon and parsley. And parsley works as a great substitute if you can’t get your hands on some. 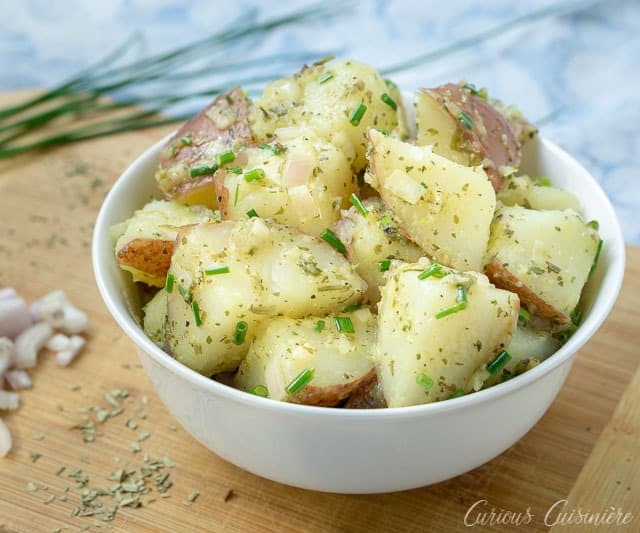 These herbs give a unique French flavor to this potato salad and make it a welcome change from your standard picnic side dish! 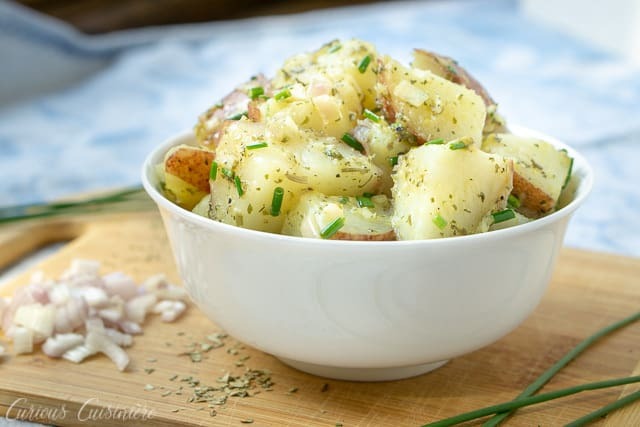 This slightly sweet, mustard and vinegar based French Potato Salad is balanced out with the perfect amount of savory herbs. 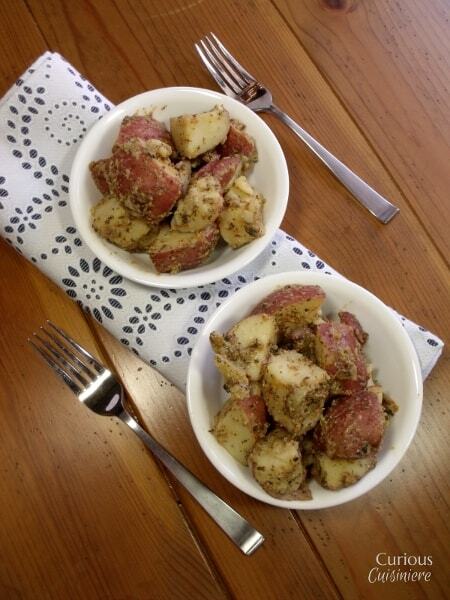 Wash potatoes and cut them into 1-1 1/2” chunks. Place them in a medium saucepan and cover with water. Heat the water to boiling. 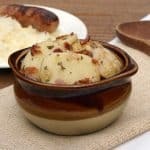 Reduce heat to medium and boil the potatoes until tender, but still firm. Drain the potatoes. 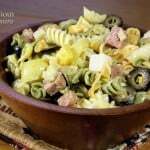 In a small bowl, mix together the olive oil, vinegar, and mustard. 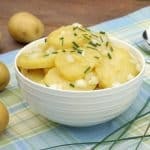 Add the vinegar mixture to the drained potatoes. 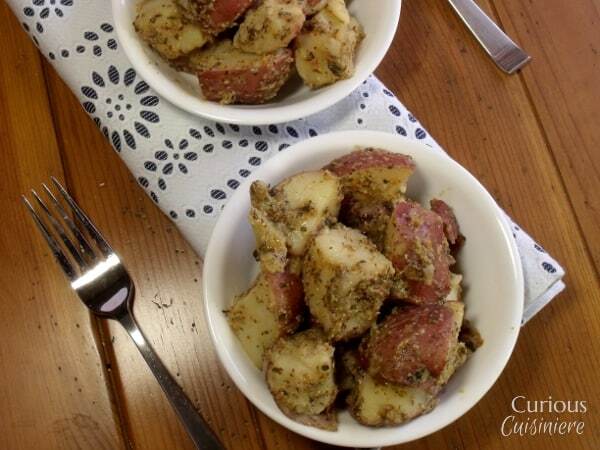 Add the diced shallot, herbs, salt, and pepper to the potatoes. Mix well to coat and evenly distribute the herbs. 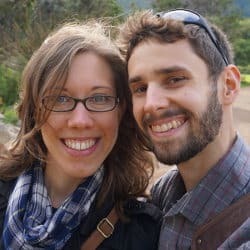 This recipe from 2013 was updated in August 2018. 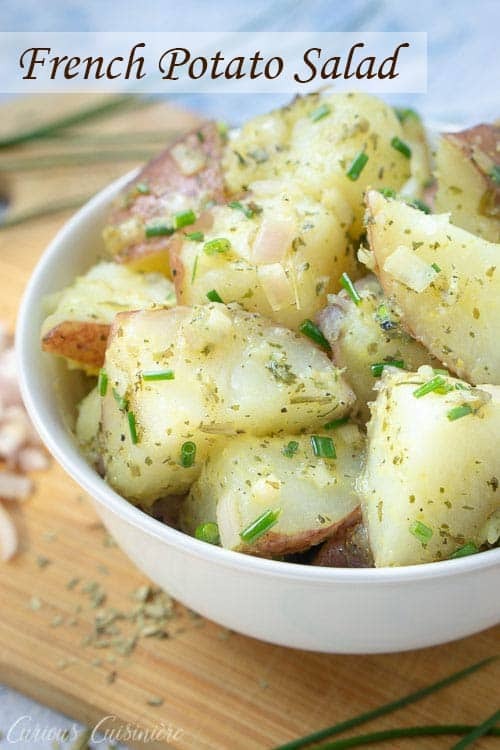 We made the potato salad even better! Enjoy!